"I'm a tad bit polka-dot obsessed." Understatement of my life. Target was selling the cutest polka dot pencil skirts and I was waiting obsessively for them to go on sale. (Yea, I don't even pay full price at Target.) But I lost the waiting game since they sold out online. However, one day I decided to stop by my neighborhood Target for a quick study break and I spotted one on the clearance rack from afar. I did not want to get my hopes up that it would be my size, but my heart was racing as I walked ran to the rack. Lo and behold, it was miraculously my size and half the price! Then the polka dotted skirt & Joanna lived happily ever after. 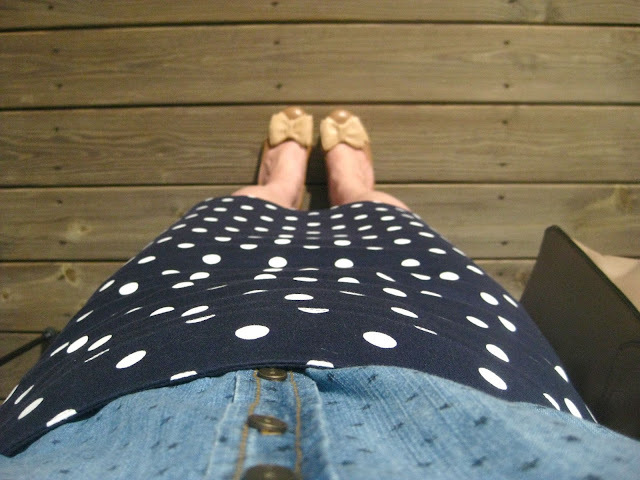 Chambray stars & polka dots & bows. Gift to myself, a scalloped purse from Asos. 1. Favorite sounds: Have you been following The Voice this season? Oh my goodness. The talent is ridiculous. Who are you cheering for? 2. Favorite moment: One of the babies in the Pediatric ICU smiled and laughed for me for the first time. Heart. Melting. 3. Favorite music cover: My friend Ryan of Sleeping At Last has been creating beautiful covers of timeless songs for Grey's Anatomy. They're all amazing. Right now I'm loving his cover of The Police's "Every Little Thing She Does is Magic"! 4. Favorite outfit: Sometimes being too matchy with colors is a big no-no, but I loved the way these matchy blues turned out. 5. Favorite read: Authenticity is something many people, including myself, have struggled with because we often begin questioning, "Is there such thing as being too authentic?" Hope you enjoyed story time and this look! You can keep up with me daily on Instagram if you aren't already! Have a great weekend friends! Happy Easter!! 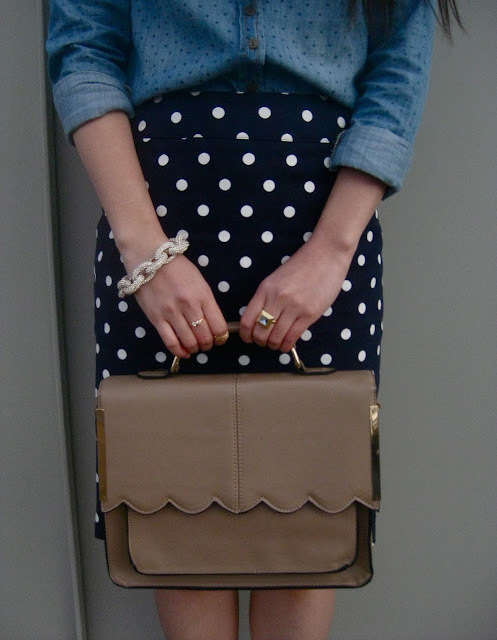 I love everything about this ensemble from the polka dot skirt to that scalloped bag! Absolutely lovely! What a happy ending to that skirt story!! 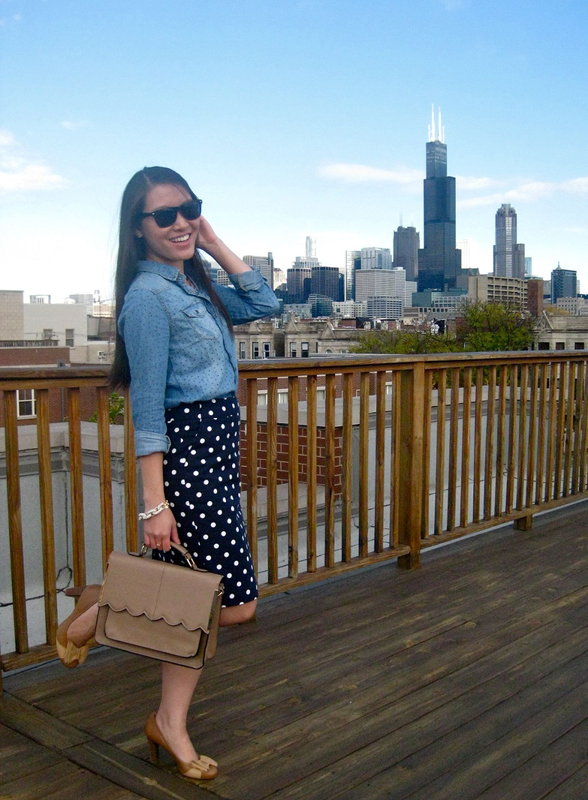 I'm a pretty big polka dot fan too, and I do love the name of your blog! Yay to happy endings! The name means a lot to me so I'm glad you love it! I am obsessed with your purse - it is absolutely fantastic!! I just interviewed The Voice Top 12 this week and got to see them perform. They are all SO talented! Stopping by via Friday's Fab Favorites. Wow! That is so awesome that you got to interview them. What a fun experience! 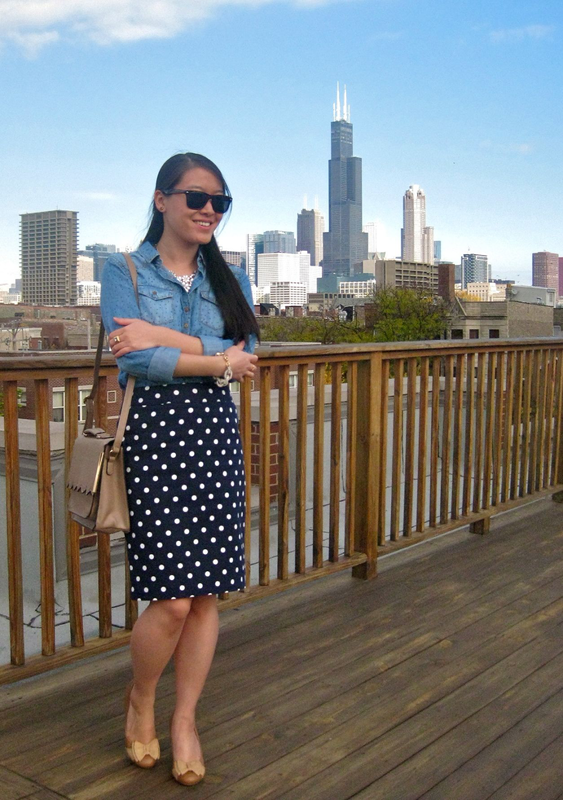 I love this dotted skirt! I just purchased one from the Loft, it's so classic! I love this entire outfit! I too am a bit polka dot obsessed :)! I have to say that bag is to die for! It is the perfect neutral color that can go with everything! Love it! Your polka dot pencil skirt is awesome!